There are many reasons why you may not be having a good night’s sleep: emotional disturbances and real life problems, workplace misunderstandings or some intellectual dilemmas. But nothing can beat the overwhelming feeling of tiredness after a night spent on an old, overused and uncomfortable mattress. Have you ever woken up in the middle of the night with a terrible back-ache, after you’ve dreamed about flying on comfy and soft white clouds, enjoying life at it’s fullest? Not even the peaceful snore of your beloved can make you feel less wry and stiff, longing for the day when you’ll finally get some quality sleep. As a result, you’ll get grumpy and moody, and you’ll spoil your safe (domestic) haven. Today, in the era of social networking and online shopping, it’s pretty easy to surprise your loved one with a cosy, new double bed mattress that will not only improve your physical condition, but your personal relationships too. I mean, no one wants to be listening about your back, neck or shoulder pain all day long. At first, it may seem mission impossible to find a suitable mattress for your double bed among all those different fillings and sizes, but I’ll try to give you a few pointers to help you decide. There are four main types of filling: memory foam, pocket sprung, latex, open coil and continuous coil. Memory foam is very soft and squeezable, and it moulds to the shape of your body offering a great support. Even though it’s pricey, the memory foam double bed mattress will transform your bedroom into a sanctuary you never want to leave. In the pocket sprung filling, all the springs are individually sewn into pockets and they do not keep the warmth of your body as memory foam does. So, the pocket sprung filling is great for those of you who are drenched with sweat throughout the night. Latex mattresses are also not cheap and are known to be very resilient, but they definitely wouldn’t be my favourite pick, because I am not a big latex-lover in general. 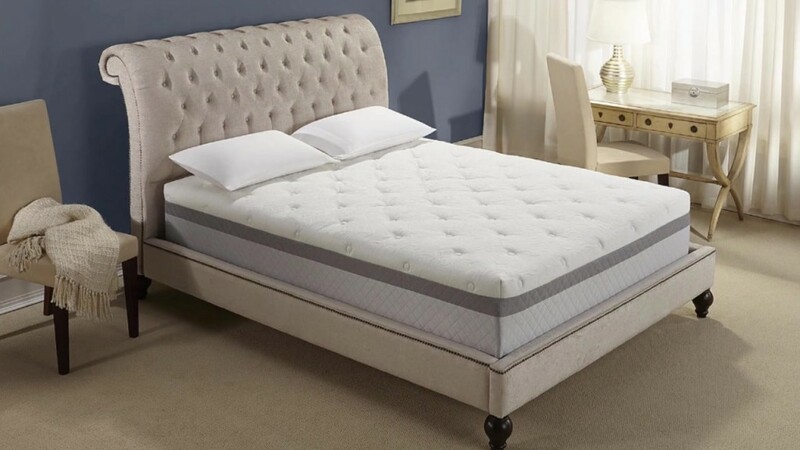 The continuous coil and open coil are the remaining types of mattress filling. These mattresses are significantly cheaper than the other types because their inside springs are connected with each other with a wire, so they move as one unit. This is a bit problematic if you share your bed with another person as you’re very likely to end up rolling together in the morning, knowing that the coils in these mattresses wear out more quickly than pocket springs filled mattresses. And finally, all you’re left to do now is to order the mattress of your choosing, and get your much needed sleep. Stop complaining, just change your mattress. You might even get a breakfast in bed.